Shepherd Song Farms is a family-owned sheep and goat farm in Northwest Wisconsin. Their brand promotes the benefits of organic, grass-fed, and humane meats, with care from birth to slaughter. Shepherd Song Farms ships product all over the United States, particularly to the east and west coast, and is a preferred supplier to specialty chefs. As a long-term partner of Satellite Six, Shepherd Song Farms desired brand and visual identity improvements to their website, assistance in creating needing marketing materials and email offers, and planning/management of their inbound marketing including SEO and Google Adwords. 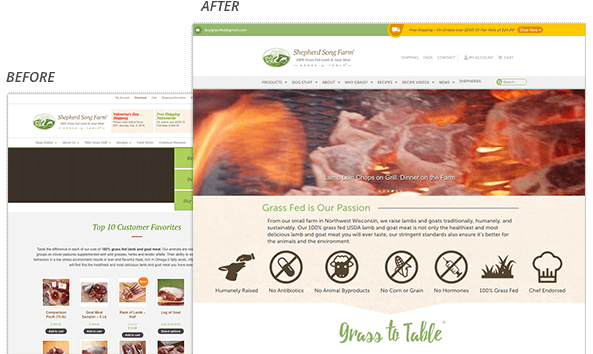 Shepherd Song Farms sought a partner to help improve the interaction and performance of their website. The owners recognized that the UI was dated and in need of streamline to ensure they were making browsing product and checking out as easy as possible. They also recognized there were many disengaging pages and overall content layout improvements that were possible to other key draw sections of the website, such as the recipe and video areas. Shepherd Song Farms partnered with Satellite Six to develop inbound opportunities, such as ongoing Search Engine Optimization and Google AdWords campaign creation and management. Satellite Six serves as a trusted advisor to Shepherd Song Farms to make strategic decisions about their ongoing web marketing. Search Optimization and AdWords campaigns account for 75.9% of the website’s total traffic, or over 43,000 visitors in 2017.